Good news on all accounts! You have some beautiful fabrics, and well deserved after such a draught! I did the same thing earlier this year-had to buy some fabric. I am drooling over yours. 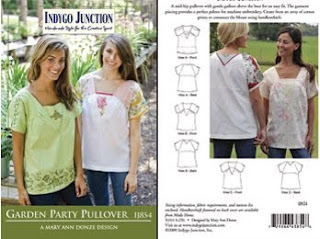 I really love, love, love that first fabric and the IJ pattern will be perfect!!! Hi Sherril! SOUNDS like your Doctor "didn't find anything" or he would have said, "come in now for a consult"... Whatdoyathink?? Beautiful fabrics! That first one really cries out (to me) to be a dress. As far as the Dr. goes - hound him. Seriously. Call Monday and ask to talk to him and don't let them push you off the phone until you get the answers from him. I agree with Rhonda that if it was bad, he likely would have called as soon as he had the path back, but don't wait. YOU'RE the patient and you deserve answers! Gorgeous fabrics, particularly that paisley knit, yum! No news is good news, but you do deserve better communication. Keep us posted. You could just consider this a Sunday purchase. You know when you fast or give up something for Lent, you are allowed whatever it is on Sunday! Ha! Great voile!! And thanks for the pattern pic, I've never seen that one! About the pathology, definitely call if you're concerned. But if it gives you a little peace of mind, they typically run a quick path immediately in the house lab to check for malignancy when the remove/biopsy of something like that. Then it is sent off for more thorough pathology (microscopic, etc.) So it sounds like the quick pathology was clean. Microscopic usually takes a few/several days. :) I'm glad it is good news so far!! Lovely lovely fabric! I hope your test results are good news! I'm sure that after a 4 month draught you were very selective on what you brought home...and it doesn't seem like that much to me! :0 You got some lovely pieces and I'm sure you will enjoy working with them. And can I just second Ann's advice! Stay well! You're only human, who could pass up such beautiful fabrics at such wonderful prices. Glad the medical news was good. Beautiful fabrics, especially the floral voile. That would make a gorgeous summer dress.